The world is evolving with new technology springing up. 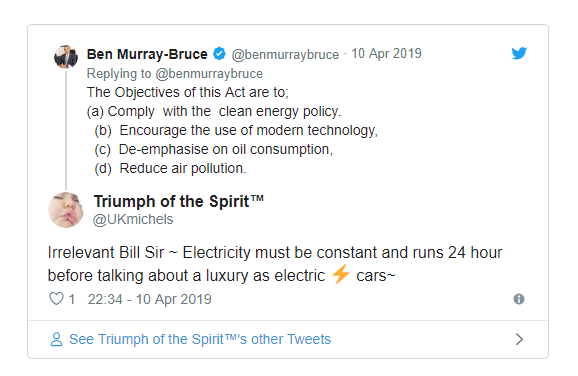 Senator Bruce believes Nigerian shouldn't be left behind, that's why he introduced his electric car bill but check how Nigerians react to this below! It is no debate that one of the Nigerian Senate' responsibilities is is making laws that will see to the betterment of the masses and good governance in the country. And to this effect, one of the Nigerian senator by name Ben Murray-Bruce performed his duty as being expected of him. He took to one of the social media platforms he engages more on, Twitter, to share two bills out of others he presented on the floor of the Senate. One of the bills presented by him is the "Electric Car Bill" which he wants, to be signed into law by the National Assembly to enable to use of electric cars on Nigerian roads. 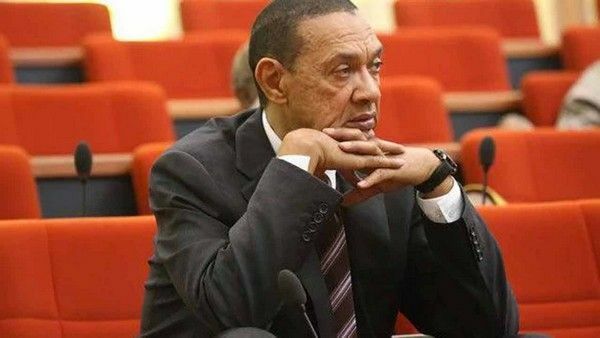 Ben Murray-Bruce is representing Bayelsa East Senatorial District in the upper Chambers and has been a serving senator since 2015. Bruce gave reasons for presenting the bill. According to him, the objectives of the act are as follows. Comply with the clean energy policy. Encourage the use of modern technology. And here come Nigerians' reactions to the bill on Twitter. As always, some will welcome the bill, while some will kick against it. A Twitter user saw it as a misplaced priority. Such misplaced priority! This is what happens when lawmakers are out-of-touch with the reality of the common Nigerian citizen. SAD! Another user said the bill was irrelevant regarding the irregularity of electricity in the country 24/7. 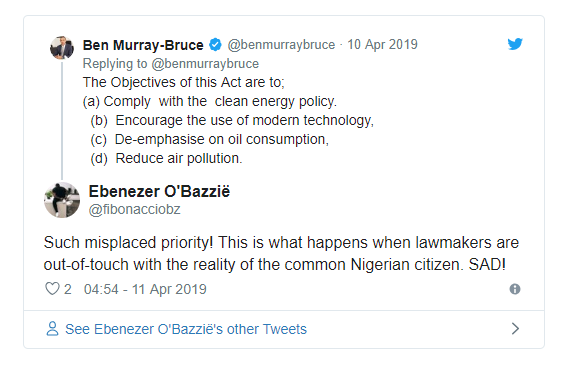 Another user went as far to tongue-lash senator Bruce saying it's a sign that he is really disconnected with his constituency. Naijauto.com agrees that at the moment, the electric car bill isn't a priority in the country. However, don't you think Senator Bruce may be actually proffering a solution to future problems? A lot of countries across the globe are now discovering crude oils, while there is a daily rise in the usage of electric cars. Approving the electric car bill is a way of joining other countries to fight climate change. 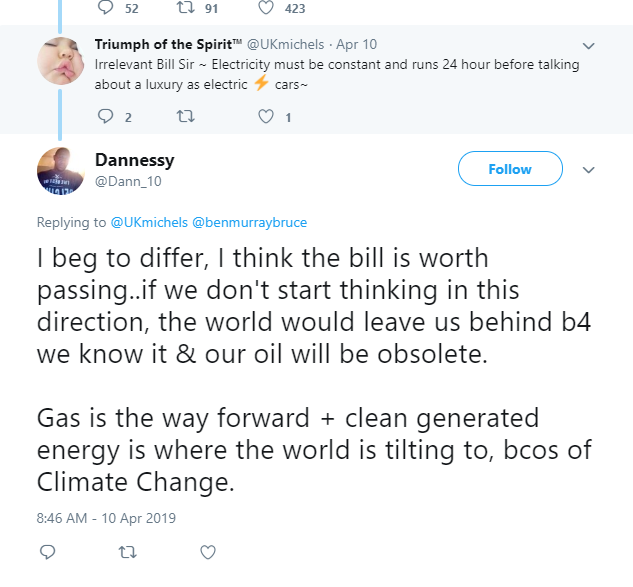 Some Nigerians on Twitter acknowledged his bill and saw it as a way to advance as the world is doing. I beg to differ, I think the bill is worth passing..if we don't start thinking in this direction, the world would leave us behind b4 we know it & our oil will be obsolete. Gas is the way forward + clean generated energy is where the world is tilting to, bcos of Climate Change. Some countries have already plunged into the new technology of electric cars. Norway, for example, will be using electric cars all through as a way to introduce zero-emission cars in their country by 2025. According to reports, electric cars outsold petrol and diesel vehicles in Norway. It’s an indication that they are out to stamp out petrol and diesel cars come 2025. China isn't left behind as it's also toeing the line to have more electric cars on their road. Nigeria should also join the train. >>> Get the latest car news & Nigerian traffic update on our news section now!